10 Greenpeace activists have scaled the Sagrada Familia cathedral demanding the release of the 30 activists who were arrested by the Russians on a Gazprom oil rig in mid-September. Greenpeace supporters climbed the facade of Antoni Gaudí's 19th-century unfinished cathedral on the morning of 8 November, hanging posters on the spires with the words “Liberty” in several languages including Spanish, Catalan and English, with photos of their colleagues, known as The Arctic 30, who are still under arrest in Russia. The Barcelona 10 remained about 100-m up for several hours while other activists handed out flyers to the curious below. 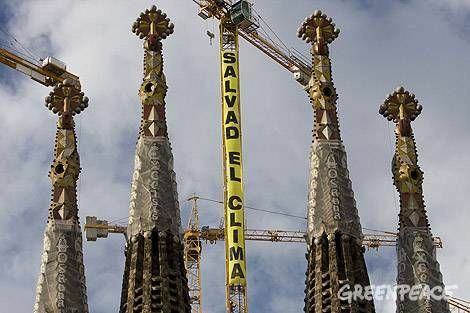 Earlier in the week 20 Greenpeace supporters hung banners on the cranes around the cathedral to focus attention of the talks in Barcelona by world leaders.